The children must listen well and follow directions to make this Santa. The patterns for the red cap and the mittens are run on red construction paper. The rest of the pieces are cut by the children. 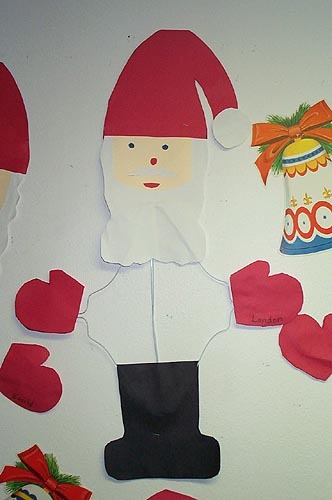 Some teachers use pieces of newspaper for the children to make patterns before cutting the construction paper beard and boots. The paper is doubled so that you have two beards and two boots just alike. A hole is cut in the front of the beard for the face. Two white wire clothes hangers are taped together to form the body. A lot of Elmer's glue must be used to get the double pieces of paper to shape around the wires. Press "Go" to search for Santa Claus.